Ramshorn Gall Andricus aries found in Worcestershire. On seeing Tony Simpson’s picture Brett Westwood wrote “Here is a picture (02) of a mangled Andricus aries Ramshorn gall taken in early October 2013 at Blakeshall in the extreme north of Worcestershire at grid reference SO833815 . Normally they are long and flattened but this one had been damaged by a hedge flailer. First record for northern Worcestershire”. These two records from north and south Worcestershire call for a determined search between the two points to help record the progress of two new galls. In 2002 John Meiklejohn illustrated this gall and other new arrivals and encouraged recorders to look out for them in Worcestershire. He wrote “Another gall not yet found in Worcestershire was first recorded in Britain in 1997 near Maidenhead and has begun to spread further afield. This is the Rams-horn gall, Andricus aries. 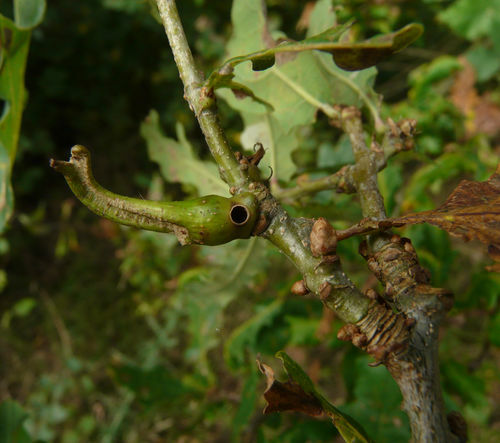 It is not an acorn gall but develops in a variety of noticeable forms on a bud on a twig. The differing forms are due to the activities of parasites and inquilines. 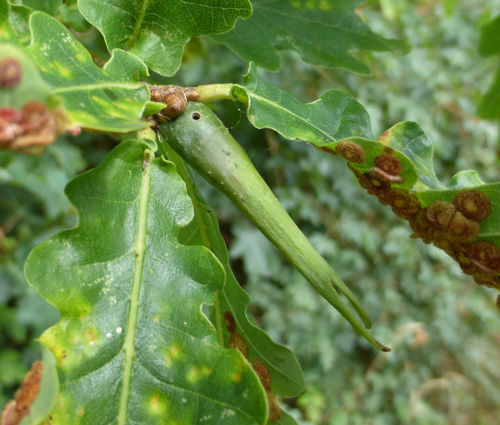 Its sexual stage is found on the catkins of Evergreen Oak”.